Work has been proceeding in order to bring perfection to the crudely-conceived prototype of the robot. According to the members of the mech team, the prototype is now 60 percent less shadier. They obtained CNC-routered side pannels, and a routered’ funnel. All that has to be done is assembly. In the electrical department, they finished wiring power to the talons. Members got the power mostly routed for the CRIO modules and sidecar.They also started wiring in-between the solenoids and the relay-out on the CRIO. This task wasn’t finished, but will be continued tomorrow. Far more experienced members and Mr. Black almost finished welding h-frames. 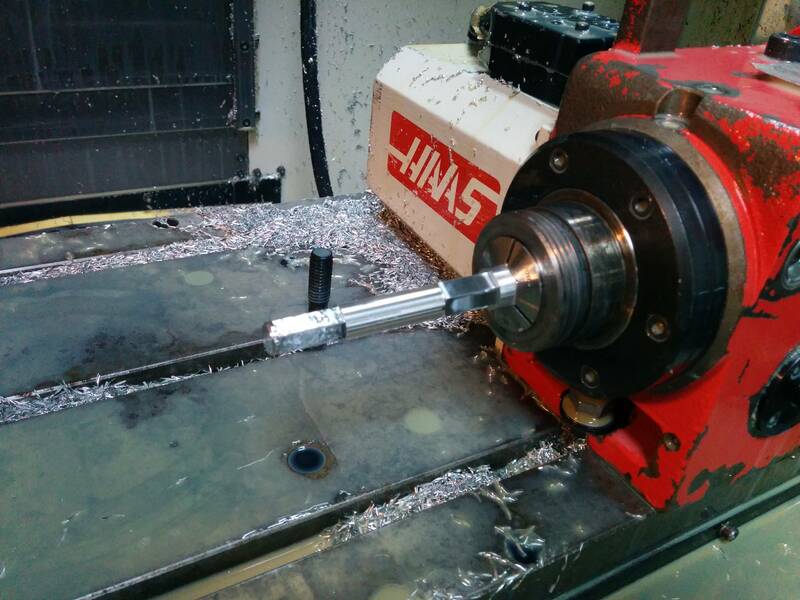 Machining of some “intake actuator clamping mounts” (pictured below) began. In the CAD department, members looked through pneumatic cylinder cad models for intake. They determined that we need a 3-inch stroke back-to-back with a 2-inch stroke for a total of 5 inches of stroke. This lets us stop either 3 inches or 5 inches in. This morning, our team sent off the two chassis(es) off to get powder coated. Surprisingly enough, we got it back at 6:00 PM– less than an one-day turnaround. With this unexpected time advantage in hand, we prepared electronics, and mounted our talons and motors onto the chassis. In the seldom-covered media team, Chairman’s Award scripts were carefully gone through. In the CAD team, members began designing the CHOO linkage, and came to a final decision regarding the geometry of the intake piston mounts. Programmers set up the net code for vision processing. They hope to finish the project in the following days. Shortly before lab opening time, our mentor, as well as three students, sent our bearing blocks, wheels, and other hardware off to anodizing; we hope to receive these parts on Friday. Students spent the day redesigning a new intake position, as well as cutting stock for welding. Parts were prepped for the powder coating process, which we will send our first batch of on Thursday.